As I take a long Thanksgiving weekend with family, I thought it would be great to work on my annual Christmas letter and give it a Thanksgiving flavor, because I do have so much for which to be thankful. Then I got an even better idea: why not just put it on my blog, complete with video and photos, and send links to family and friends? Because of GTD, instead of procrastinating I asked “What’s the next action?” and wrote this post. Because of WordPress.com, there really isn’t much of a “step two” to this project; I can send emails with the permalink to people in my address book, but the duplicating, addressing, stamping and mailing part of this GTD project is, with only a few exceptions, eliminated. For some folks who I know don’t have easy internet access, I can print this page and mail it the old-fashioned way. They’ll miss the video…but at least they’ll get something, which will be a big improvement over most years. 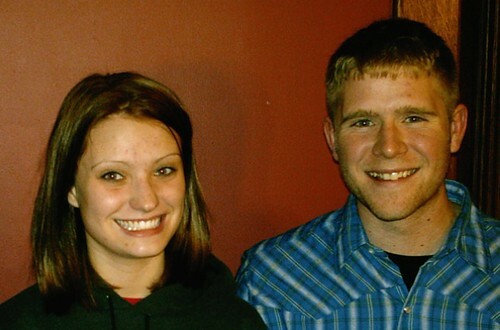 My top ten blessings are in no particular order, but the biggest news (#1) for our family is my daughter, Rachel, meeting and becoming engaged to Kyle Borg, a young man from Fairmont, Minn. They are to be married December 30. Yes, this December 30. We’re very thankful the Lord has brought these two together, even using Facebook as the means for them to meet. Funny what happens when you search for people with a common interest in theology! You can read more about their story here. With the bittersweet feelings of having my first daughter getting married, it’s (#2) nice that she, her two sisters my 8-year old son still call me “Daddy.” There’s no age better than 8, when little boys still think Daddy knows everything. Johnny turned 8 yesterday, and his next-oldest brother, Joe, turns 12 today. Come to think of it, age 12 is pretty nice too. So are 15, 16, 19 and 20. Our six children (#3) are doing well in their education. Jacob and Rachel are in college at University of Wisconsin-La Crosse. Rebekah is having fun and getting all A’s at Austin High School (and excelling at Food Science!) Ruth, after having attended AHS last year as a freshman (and getting all A’s), decided she wanted to come home for another year of homeschooling. Next year she will follow in Rachel and Jake’s footsteps and attend Riverland Community College through Minnesota’s Post-Secondary Employment Options program, which will let her earn her two-year Associate of Arts degree at the same time she graduates from Aase Academy. We’re thankful she has the option to do that. Joe and John also are still homeschooled, and Lisa is enjoying being able to focus on them. Rebekah getting to play varsity volleyball (#4) and basketball (#5) as a sophomore adds to our fun. As I’ve mentioned before, she’s my favorite volleyball player and we enjoy watching her play. What’s even better is what we found out at the awards banquet: she’s her teammates’ favorite, too. My job with Mayo Clinic (#6) is next. Given my former career in politics, during which my employment depended on election results, having a job is always something for which I am thankful in November. But I can’t imagine a better and more fulfilling job in media relations than working to help draw attention to Mayo Clinic’s important research and programs, and helping to tell some amazing and heart-warming stories of patients and their families, and the staff members who care for them. The next item is a prime example. In February I had the pleasure of meeting Jesse and Amy Carlsen and their twin daughters, Abby and Belle. 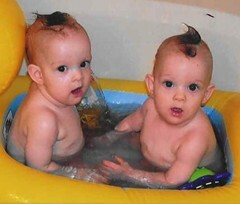 As it seems the whole world knows now, Abby and Belle were no ordinary set of twins, and their parents are special too. It was really rewarding to be part of telling the story of the twins’ separation on May 12 and their successful recovery (#7). The girls have their first birthday party tomorrow (see the pictures below.) Their story got world-wide attention, with extensive or repeated features by the Star Tribune, NBC’s Dateline and Today, along with scores of stories by all of the TV stations in the Twin Cities. 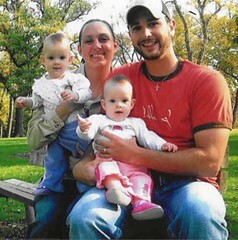 WCCO TV had an update story on the Carlsen family earlier this week, and has posted a still photo slideshow, too. As much as I appreciate my job, one of the best parts is it lets me live in my home town (#8), with my brother and his family here and my parents still alive and well, with my in-laws also close (40 miles away) and able to visit. We had our big celebration here yesterday. At the end of the video below, you’ll see my sister-in-law, Sarah, playing hide-and-seek behind a pillar. She must have been thinking that if she couldn’t see me, I couldn’t see her. Besides card-playing and gorging on a cornucopia of cholesterol-laden dishes, I also was challenged to a game of ping pong by Rebekah. The end of the video below from her follow-up game with Joe gives more insight into why she’s so fun to tease. Be sure to watch the slow-motion at the end. Lisa (#9, but again we’re not going in order of importance! ), is my bride of 21 years, 11 months and two days. In some ways, as Steve Martin would say, it seems like it has just been two years, five months and 17 days…but in others, it seems I’ve known her forever. We met 25 years ago last month, when we were freshmen at Waldorf College. She is God’s greatest gift to me, aside from His Son, and a daily reminder of His grace (#10). Which brings me to the “Thanks” part of Thanksgiving. Thankfulness is a personal thing. By that I mean you thank someone or, better yet, Someone. Thanking “lucky stars” or good fortune is meaningless. You thank people who have done good to you, and you can offend them by being ungrateful, ignoring or denying the gift. It doesn’t make sense to say “thanks” if you think blind chance or impersonal luck has led to your favorable outcome. Thanksgiving originated with Pilgrims sharing a meal with their native hosts and giving thanks to God for bringing them through safely. Lisa and I join them in thanking Him for all of these blessings recounted above, but most importantly for sending His Son to be the light of the world, and that He has shone in our lives. We pray that we and our children will reflect that Light, and that in this Christmas season many will see and delight in the glorious gospel of Jesus Christ. And may we be truly thankful. I forgot to mention that Joe WON that game. happy thanksgiving to all of you as well. We need to get together sometime soon. We are so excited for the big wedding coming up. I am sure, Lisa, you are crazy busy. Give us a call sometime and we will have to set up an evening out. One more note, Besafe will not allow us to view your video and pictures.